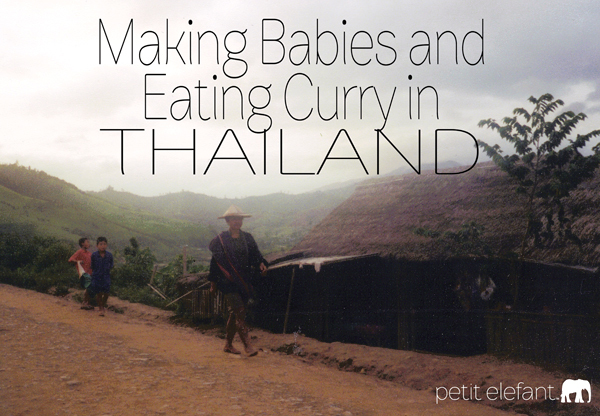 I got pregnant with my oldest in a bamboo hut in a refugee camp on the borders of Myanmar and Thailand. We were working with Karen refugees that were chased out of Myanmar for their beliefs. Now they resided in a camp managed by the Thai government. We were welcomed there but still had to abide by the rules. One of those rules was lights out at 7 PM. Not much to do in a dark bamboo hut after 7 PM, if you know what I mean. Cue lesson in the birds and the bees. Like a Cabbage Patch Kid, we joke with our oldest that we’re going to get “Made in Thailand” inked on his rear. Nothing puts red on the cheeks faster than telling your child where he was conceived. Parents are, like, so embarrassing. 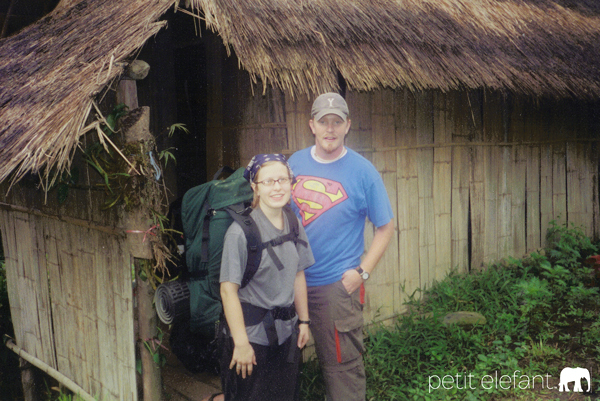 That was the beginning of our six week trek across Thailand. Newly pregnant, I had nothing to show for it except waves of nausea that crept in at the most inopportune times. Everyone told me the best part about Thailand was the food. They were all liars. Cashew coconut chicken curry turned my stomach like nobody’s business. Comfort food was nowhere to be found. Instead, I laid my head in villages and was served things like bamboo soup (seriously, are you even supposed to eat bamboo??) and fish with eyes that were staring back at me. I watched dinner run around in the dirt even after its head was cut off. The worst, though, was the curry. I couldn’t handle the spices, not as in spicy food, as in the ginger and the coconut. It turned my stomach. For a long time. Nine years to be exact. I’m not a dramatic person, but when I think about the to-do I put forth by refusing to go near Thai curry for nine years, all I can say is, “Gah! Really?” Really, y’all. The smell brought back memories that turned my stomach again. I couldn’t handle it. Surely anyone who has ever been pregnant can sympathize with me. Then one day something magical happened. I smelled Thai food, and it didn’t turn my stomach. I bravely tried some, and it turns out that those liars were right. It was like a little piece of magic entered my mouth, and I couldn’t believe I resisted for so long. 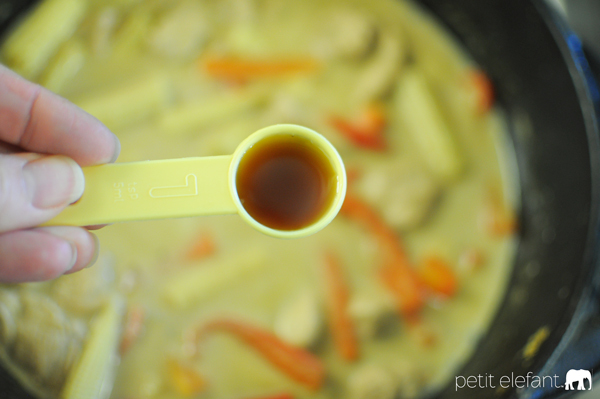 It’s a full circle kind of thing, because now I make Thai curry at least twice a month. It’s easy, and it’s delicious. Win, win. 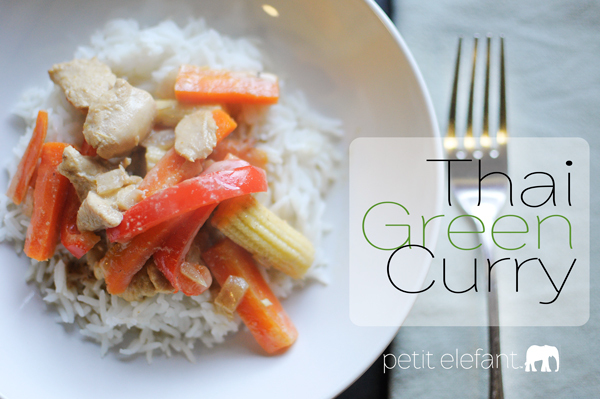 Check out my favorite go to Thai green curry recipe below! 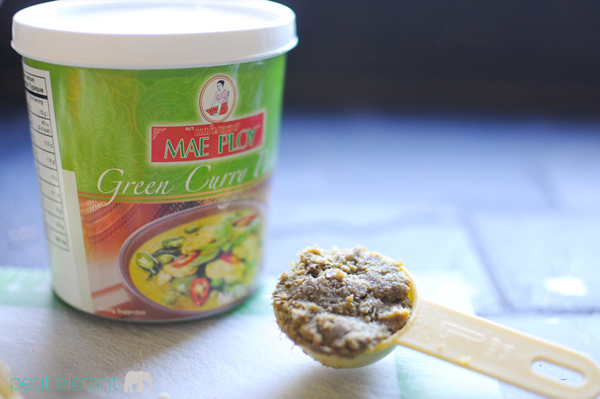 2 tablespoons Thai green curry paste (my favorite is Mae Ploy). Warning: it will be warm. If you don’t like it too spicy, add less curry paste. *You can really pick any vegetables you want. Broccoli, asparagus, and snow peas are great additions to get some green! 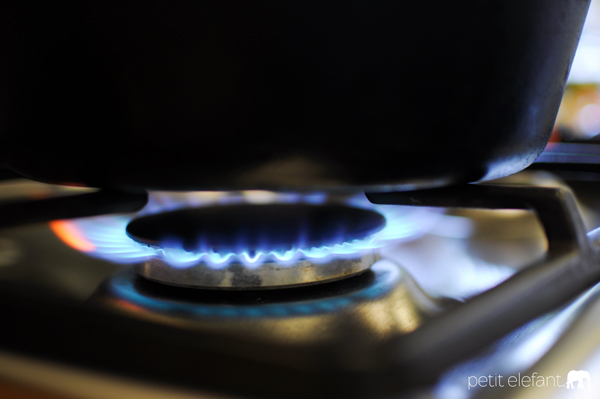 Pour a little olive oil into the pan and heat it up. 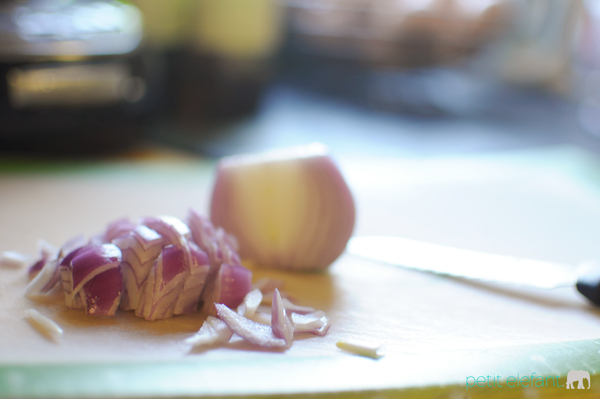 Add the onions and cook until soft. Add the curry paste and try not to cry from the heat. Cook for about 2-3 minutes. 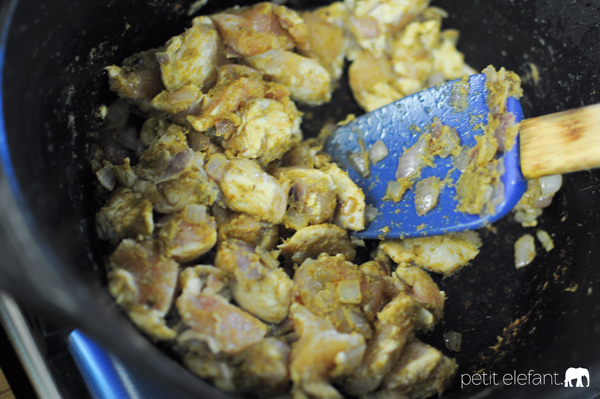 Stir in the chicken, making sure it gets coated in the curry paste. Cook until the outside is white. 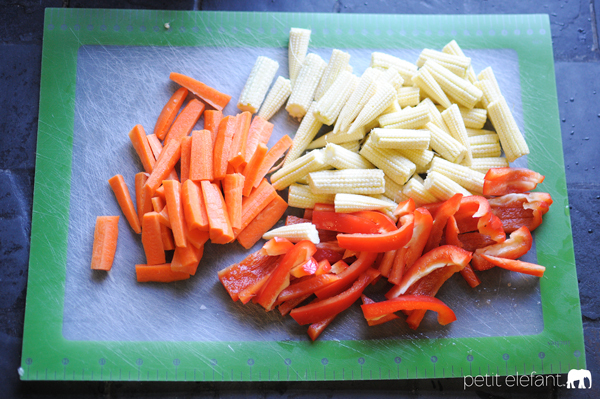 Stir in the coconut milk and all the veggies. Simmer until chicken is cooked and the veggies are soft. Turn off the stove and add the fish sauce. Serve up with your favorite rice! Personally, I prefer basmati. Thanks for the recipe! Can’t wait to try! My daughter will be 11 on the 27th and I still can’t eat green peppers. I can smell certain perfumes and gag. I get it. I’m glad you are able to enjoy Thai curry now! Isn’t that the worst? Hopefully one day those smells and foods won’t make you gag! It’s the worst feeling!